Did you know that people with $25 Million or more are the least likely to consider retirement? 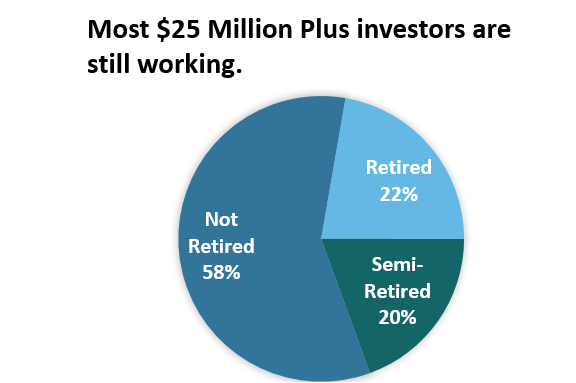 More than 18 percent of those with $25 Million Plus indicate they never plan to retire. Another interesting fact....more than 70 percent of them work or did work more than 40 hours per week during their careers. A large percentage, 40 percent, worked more than 50 hours per week. -Invariably we find that wealthy people attribute their success to "hard work". So if you want to be successful...it's time to buckle down and put in the hours that you need to be successful. -Almost all of those who have a net worth or more than $25 Million have a college degree and a large percentage have a graduate degree. Don't pay attention to those who say taking on debt for education isn't worth. Clearly the data will show that they are just wrong. -Finally....find something you love to do. These wealthy households aren't retiring because they love what they do. Work hard. Get an Education. Do something you love....and you can be successful! Sounds like the American Dream is still alive! To learn more about $25 Million Plus Investors, click here or contact Randy Wostratzky at rwostratzky@spectrem.com or 224-544-5195.